The Salida model has 2 Beds and 2 Baths. 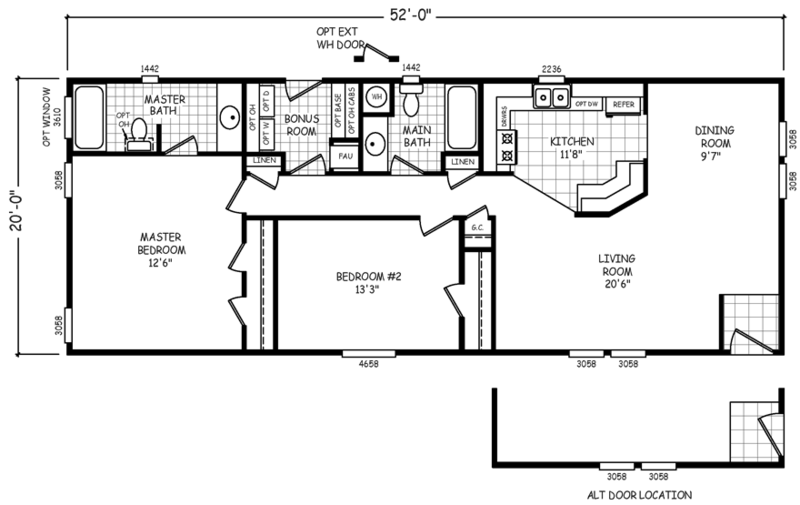 This 1040 square foot Double Wide home is available for delivery in Arizona, California, Nevada, New Mexico, Colorado, Utah. The open and seamless living/dining area of the Salida model is purely family oriented. The cooking, eating, socializing and entertaining all take place here. Plus, the sleek raised snack bar in the kitchen provides yet another reason to meet in the middle. Homeowners will be pleased to plenty of closets throughout. If pictures are shown, they may depict upgrades and options that are not included within the base price of the home. Ask your housing consultant for details about the other great features that come standard on the Salida manufactured home.